3-17-2019 Intel Guru MarkZ [your opinion on dela rue machine, or let them send it away, to be verified.] After talking to a treasury contact ...and a number of banking contacts…they told me to NOT LET OUR CURRENCY OUT OF OUR SIGHT…so that’s what I am going to do. 3-17-2019 Newshound/Intel Guru Mnt Goat Article: "COOPERATION OF AMERICAN COMPANIES TO ENTER IRAQ, ESPECIALLY IN FOUR PROVINCES" Quote: "This year will see a great opening and a clear renaissance in the country." This is all fine but how will the companies transfer funds in and out of Iraq? 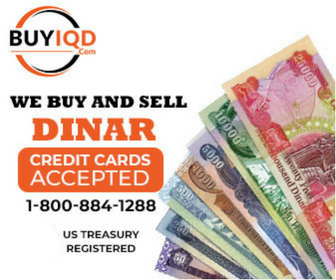 Will they want to convert dinars to US dollars in the currency auctions? I don’t think so…They will want to do through the banking process and they use FOREX. Oh – but the rate is not yet on FOREX.